I've now started with subjects seven and eight in my project. On my display I now have the Zero, the Val, the Wildcat, the Catalina, the Buffalo and the Avenger. I'm considering starting at new page on this site to write more about the history of each models subject. Like I do on the social medias. Well we'll see how long that will take to get in place. I've written a few words about this kit in previous posts. It's the last addition to the collection and for a long time I thought that there was no such kit in scale 1:48. But somewhere I picked up traces of an old kit that had existed and started to hunt. Lo and behold when several turned up in a search on Ebay. I finally got one from Germany. Now this kit is from the 70's and that is apparent. The level of details is scarce, there is a lot of moulding flash and uneven surfaces. After all these years I also suspect the decals are shot to pieces but the colours is all wrong anyway. But still it's a Jake in the right scale. This will probably be quite a quick build. I could have spent ages on detailing and generally fix things up on this one but I've decided to do my best with what there is. I'll need some new decals but I think I can scavenge leftover from other kits and/or I will do some serious masking which would be a first for me. I also have to decide on which Jake to do. I have the choice of two planes. The first is the one from the Heavy Cruiser 'Tone' that spotted the American fleet but failed to identify the carriers which proved to be fatal for the Japanese. The second is the one from the Heavy Cruiser 'Chikuma' that found and tracked the USS Yorktown for three hours leading to it's sinking. Now this kit is the definite opposite of the Jake kit. It comes with extra everything. Etched metal parts, paint mask, separate decals for every instrument (in pairs if you should fail one) and even a small poster with the box art. The mould is crisp and it generally looks promising. This one will take more time but will also be more gratifying to build. I will build this with the wings extended as I have done with the other planes in this project. It's a shame though as the kit includes pristine metal arms for the folded wings and is well detailed in the wing interior joints. It's a shame that this kit from Great Wall Hobby is not generally available any more. I had to hunt this one down at Ebay too. This time I got it from China. 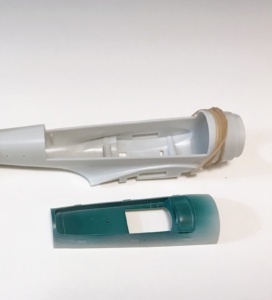 GWH has released this kit in three issues, the last with floats. You can still pick them up on Ebay at a reasonable price. As an extra bonus the kit includes the markings of exactly the plane I want to build, the plane piloted by ensign Gay at that fateful day 4 June 1942. The last week I've discovered the real depth of scalemates.com! Not only does this site have information on virtually every plastic model ever made but also rich community and a function to keep track of your kits. 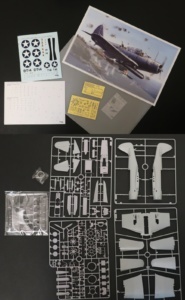 If you register you can keep track of which kit you're building, have built, have in your stash or have on your wish list. You can set up projects and share info on what you're doing. This site is a must for all modellers!